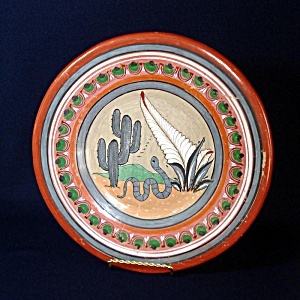 This 12-1/4 inch decorative Mexican pottery charger or wall plate is made of heavy earthenware clay, unglazed on the back. 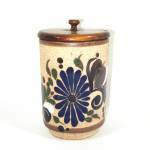 It isn't marked or signed, but is very typical of the hand thrown, burnished folk art pottery of the Tonala, Jalisco region of Mexico during the 1940s and 1950s, with traditional earthen colors and "flora y fauna" design motifs. The scene depicts a friendly-looking snake amid cactus, ferns, and succulents in pleasing shades of terra cotta, rust, peach, green, gray, white, and black. The snake is an unusual subject for this type of charger - most Tonala plates depict birds, deer, or rabbits. The front of the plate has some rub marks and small scratches from age. There are no chips or cracks. A reinforced hanging hole is molded into the upper back for display where a cotton cord is attached.